It was first introduced during the late ’60s and is still being used for skin rejuvenation. Due to its side effects, it has largely been replaced with fractional mode lasers, which has fewer side effects and heals faster. It is not apt for darker skin tones. Skin Conditions: It is used in case of skin cancer, acne scars, deep set wrinkles, birthmarks, other scarring warts, moles, skin tags, saggy skin (encourages collagen production for skin tightening), corns on feet, and sun damage. Side Effects: It takes long time to heal huge risks of pigmentation, pain, itching and burning sensation, skin redness and scarring. It helps remove surface-level and moderately deep lines and wrinkles on the face, hands, neck or chest with minimal burning of surrounding tissues. With lesser side effects, it heals faster than CO2 Laser treatment. Skin Conditions: It is used to cure pigmentation problems, acne scars, sun damage, fine lines, small to moderate wrinkles, and moles. Side Effects: It may cause redness, swelling, and bruising, which may last for 1-2 weeks. 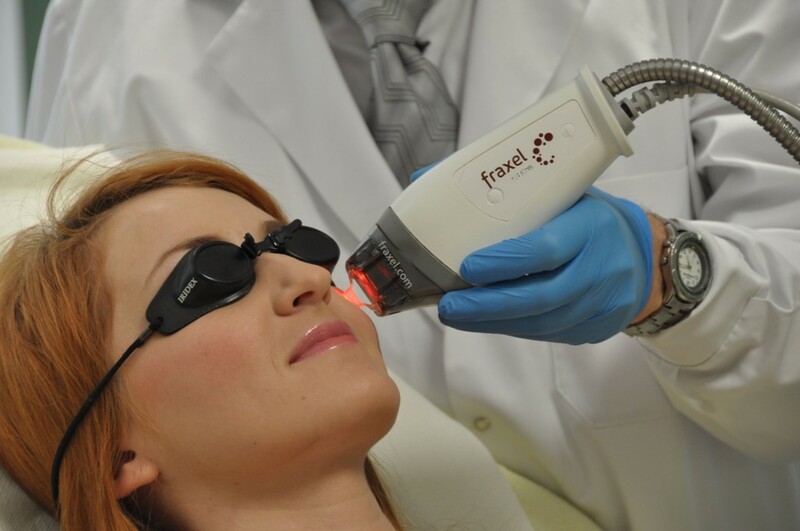 Unlike ablative technologies that heat and remove the top skin tissue, non-ablative (or non-wounding) laser work beneath the surface skin layer. It stimulates collagen growth and tightens the underlying skin to improve the skin tone. It also removes fine lines and mild to moderate skin damage. It treats the skin by targeting the blood vessels directly to shrink them, making the skin less red. It feels like a rubber band snap, and can be used anywhere on the face and body. It needs around 3 to 5 sessions of treatment. Results are permanent. The time taken for healing is just a couple of hours, during which the pinkness and the redness subsides. Skin Conditions: It is used to treat spider veins, birthmarks, rosacea, broken capillaries, stretch marks, vascular lesions, and fine lines around the eyes. Side Effects: Temporary pigmentation and a little bruising are normally reported. Neodymium-doped Yttrium Aluminum Garnet is a crystal that is used as a laser medium for solid-state lasers. These emit a wavelength of high energy light, which when focused on a certain skin condition, creates heat and destroys the diseased cells. Skin Conditions: It is helpful in treating vascular lesions, pigmented lesions, skin pigmentation problems, spider veins, tattoo removal and hair removal. Side Effects: It has a low success rate. In case of vascular lesions, there is a high chance of recurrence. There can be pain during the treatment. Redness, swelling and itching may last up to several days after the treatment. This laser emits wavelength of high energy light that is converted to heat energy. This damages the specific target area. This laser uses the process of photothermolysis, which means using light (photo) to heat (thermo) a selected area for destruction (lysis). Alexandrite lasers cause very precise tissue destruction of the lesion and leave tissue in the surrounding area undamaged. Skin Conditions: It is used to treat brown spots due to sun damage, birthmarks, pigmentations, and pigmented lesions. It is useful for hair removal, tattoo removal and leg veins. Side Effects: Pain during treatment is common. Redness, swelling and itching may last for a few days. It may also cause changes in pigmentation. The light-based treatments are also used to cure skin problems. Though they are not exactly laser treatments, but are similar to it in terms of purpose, procedures and results. The results of laser and light-based treatments vary, depending on the technology and treatment. When properly performed, laser and light-based treatments can visibly improve the skin conditions and problems. And they also rejuvenate the skin. Recovery too, varies, depending on the type of procedure employed. Mild treatments, such as those with low-powered lasers typically have very fast recovery times, generally a few days to one week. This type of treatment does not result in heavy peeling, oozing or crusting of the skin. Aggressive laser treatments require a longer recovery period. Typically, the skin will go through various stages of redness, oozing, crusting and peeling for one week. After that, the skin may remain pink for up to another two weeks. Laser is a surgical procedure and all surgical procedures carry some risk. Ablative laser and light-based treatments can result in infections, cold sores, milia (small white elevated cysts of superficial skin), darkening of the skin (particularly if exposed to the sun after surgery) or cysts. With advancing technology, there are new types of lasers being introduced for various skin problems and skin types. And with so many different types of laser skin treatments available, it is difficult to zero in on the one that will work for you. So it is very important to consult an experienced dermatologist to finalize the treatment plan, tailor-made for you! Do you suffer from skin problems? What treatments have you tried? Have you thought of Laser treatment for skin? Share with us in the comments section below.